Milorganite now has more nutrients packed into a smaller amount of product. It’s like concentrated dishwashing detergent. It’s the same product, you simply use less of it while getting the same results. The percentage of nutrients in Milorganite fluctuates over time. It’s the nature of the product. Recently, the nutrient profile of Milorganite changed. Its N-P-K (nitrogen, phosphorus, and potassium) analysis increased from 5-2-0 to 6-4-0; it now has more nitrogen and phosphorus than before. To accommodate for this nutrient increase, Milorganite decreased its package size from 36 lb to 32 lb, rather than require customers to re-calibrate their spreaders. (Although we always recommend calibrating your spreader to reduce the risk of overapplication and possible nutrient runoff.) We felt it was more convenient to reduce the bag size to achieve the same results. 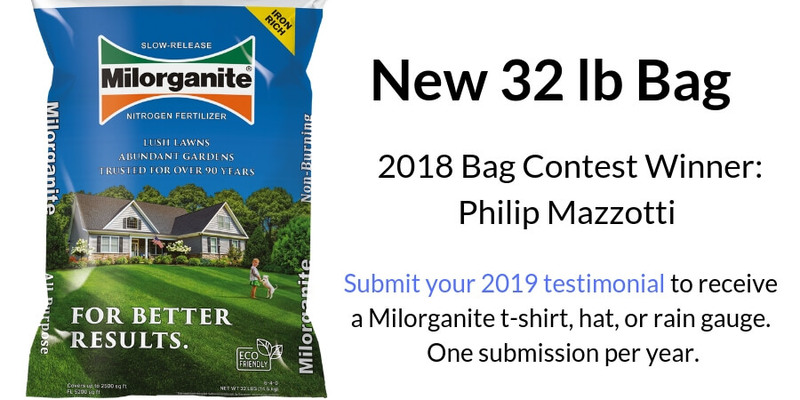 Thirty-two pounds of Milorganite now provides the exact same coverage as the former 36-pound bag—2,500 square feet of lawn. Yes, you’re getting less product, but the impact on your lawn, landscape, and garden remain the same. Although the increased nutrient profile may or may not seem like a huge change, it’s important to us that our customers understand that the quality and effectiveness of the product, spreader settings, and coverage remain the same. Milorganite, first and foremost, a water-based, environmental organization. We’re very sensitive to the issue of over-application of fertilizer, which can increase the risk of nutrient run-off. News stories highlight the adverse effect of runoff on our waterways. The potential for and effects of runoff continue to drive regulatory control of all fertilizers. It’s sometimes too easy to apply more Milorganite than necessary, because of its ease-of-use and little, immediate visible impact on your lawn. Synthetic fertilizers provide a quick growth spurt for your lawn. You’re going to see results in only a few days. Milorganite is a slow-release nitrogen fertilizer. Although it takes longer for the nutrients to be available to plants, it lasts for a longer period of time and provides nutrients at a rate plants can use. It may be tempting to apply more Milorganite than necessary to speed-up the process, but it simply doesn’t work that way. You can’t speed up nature. Over application is also a waste of money, product and your time. While Milorganite is one of the most environmentally friendly fertilizers available, it’s important for us to help our customers do what they can to protect our environment, which includes only applying the recommended amount. We’re confident you’ll achieve the same results from Milorganite you expect for your lawn, landscape, and garden without compromising the environment. The amount of nutrients in Milorganite has increased, so you’ll need less product to achieve the same results you expect. Our faithful customers have come to trust and rely on Milorganite to achieve the lush, green lawn for which they strive. You’ll just use 32 lb of Milorganite instead of 36 lb.